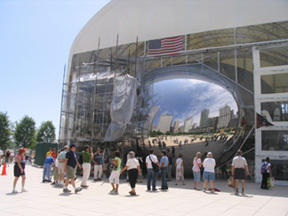 The first of Millennium Park's crowd-pleasers to develop a major problem was Anish Kapoor's Cloud Gate, or, as rechristened by an enthusiastic public that took to Kapoor's highly conceptual sculpture on its own terms, "The Bean." 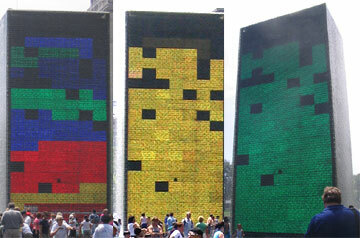 The work made its debut last July despite the fact that it wasn't finished. The seams between the 168 individual metal plates still had to be ground and polished away to create the sensuously continuous object that the sculptor had envisioned. The process was to have begun last September, but the popularity of the park proved so immense that Cloud Gate didn't wind up back under the tent until this past January, when corrosion could clearly be seen forming around many of the joins. It was thought the finished sculpture would finally be put on display this spring, but it wasn't to be, and the work continues. For months, the astonishingly reflective north nub has been peeking through the worktent like the head of a newborn emerging from a mother engaged in an almost sadistically prolonged labor. 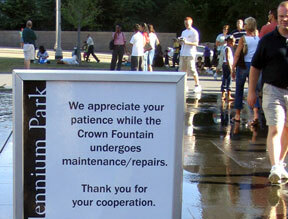 In the process the original budgeted cost has almost doubled, to $17 million. According to Karen Ryan, spokesperson for the Department of Cultural Affairs, no completion date has yet been set. 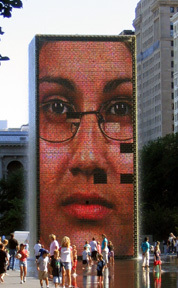 Now there's been a meltdown at Jaume Plensa's award-winning Crown Fountain, the shallow sea of water stretched between two 50-foot tall towers whose LED panels project an array of more than 1,000 different faces that spout water from pursed lips. For starters, recent visitors to the park have noticed "dropouts," blank spaces interspersed like zits on the faces of the south tower. Ryan says Barco, the Belgian-based manufacturer that installed the one-of-a-kind displays, has traced the dropouts to power-supply failures in the LED panels, which it believes are the result of the recent soaring temperatures. She says Barco employees and its subcontractors have been working "around the clock" since the end of July testing connections and replacing parts, which must be custom made and programmed specifically for the fountain. She expects the south tower faces to be up again by the end of this week, and adds that, as all the work falls under warranty, no additional spending by the city will be required. Since hot summers are probably here to stay, Barco is also looking at ways to make sure the dropouts don't reappear. 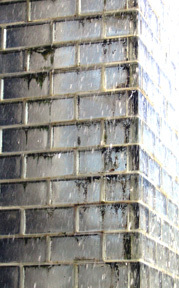 On the southwest corner of the same tower visitors can also see streaks of discoloration creeping up the inside of the glass blocks. "It's actually algae," says Ryan. 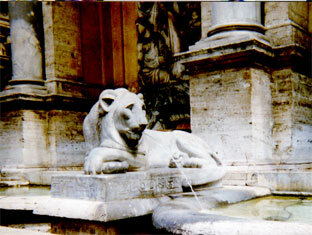 Heat and humidity are again being blamed; the corner where the algae appeared is also the part of the fountain that gets the most direct sun. Ryan says the blocks should be cleaned soon and the process may have to be repeated every three to four weeks. 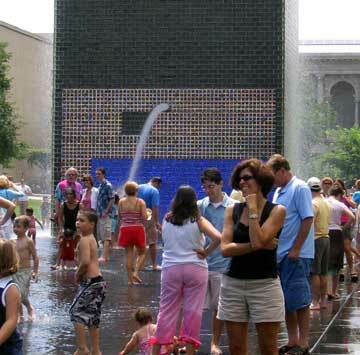 But to be honest, even as Plensa's vision was compromised, however temporarily, by the replacement of the giant faces with a projection of a rotating test colors, the throngs continuing to crowd the fountain and the laughing kids running through its waters scarcely seemed to notice. Last July at the park's unveiling, Plensa explained the impetus for the work by describing walks he'd taken through Rome and the "marvelous fountains that they did 500 years ago. Unfortunately they carved the figures in stone, and for 500 years they have exactly the same position. I think today technology allows us to go a little bit farther, and it was an intention for me to try to develop that concept in Chicago." 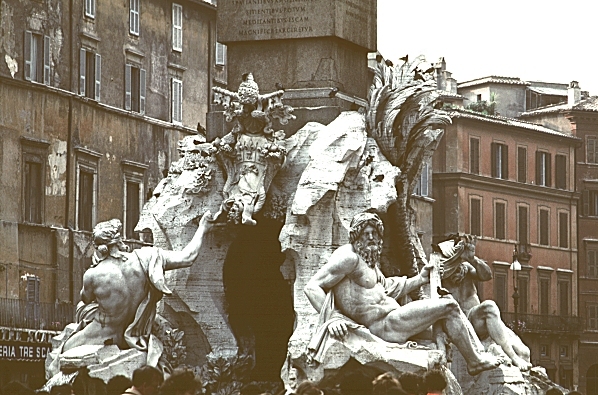 Of course you can still experience Rome's fountains pretty much as the locals did when sculptors like Bernini created them several centuries ago, but Plensa's fountain, like Kapoor's sculpture, has yet to survive an entire year without serious complications. Even as it helps redefine what an urban park can be, the bright new world of dynamic high-tech sculpture is proving trickier than anyone imagined.